"It's either my way - or no way." 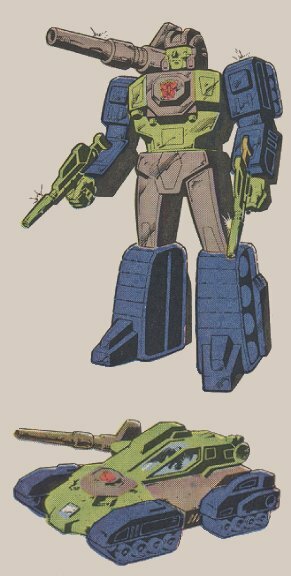 Profile: The only way to get Hardhead to follow advice is to persuade him he came up with the idea himself. He knows only one way to do anything - his way. He's as stubborn as a Buick with a six year old battery on a cold winter's morning. He doesn't talk too much, but when he does he's usually brief and to the point, never sparing the emotions of others. Some would say he's businesslike, others would say rude. Soldiering is his life; the primary reason he left Cybertron was because he had become disenchanted with the Autobots' military tactics, not because he sought peace. On the battlefield, he's just as stubborn as anywhere else. Retreat is a dirty word to him - he'll fight until there's nothing left of his enemy... or himself. Duros is ideally matched to Hardhead. The Nebulan enjoys warfare as much as the Autobot. For years, Duros had served as the chief of security for the Nebulan Ruling Council. But he found the job fairly boring - Nebulos had been at peace for so long that the opportunity for action was rare. The binary-bonded pair quickly discovered their mutual interests and put aside any lingering distrust of each other. Of all the Autobot Headmasters, Duros and Hardhead get along the best, but Duros's eagerness to embrace warfare has alienated many of his fellow Nebulans, including most of his family. Even his wife has become estranged from him. Duros is a dependable, resourceful warrior who rarely shows emotion - to do so might reveal the pain that the wreckage of his personal life has caused him. Abilities: In tank mode, Hardhead has a maximum road speed of 155 mph. He's impervious to most armor-piercing artillery and is resistant to most thermal and electromagnetic beam weapons. His range is 450 miles. He carries a 120mm laser-guided gun that shoots a variety of incendiary, sonic and explosive shells. In robot mode, he uses two shatterblasters, guns that shoot diamond-hard crystal shards that can shred a foot-thick steel wall with one burst. His tank mode exhaust gases can melt the finish of any vehicle or robot following too closely behind him. Weaknesses: Although resistant to most exterior fire, Hardhead often suffers internal injuries from the recoil of his own weapons.